I love to write about my feelings on the cusp of big changes. I've done it here and here when preparing to go back to school, and now that time is here again. Many of my readers are teachers, but even if you aren't, I know a lot of people who feel like September is one of those fresh start months. In my world, everything is new: new routines, new school clothes, new classroom set ups, new levels of enthusiasm for the teacher life that has not stopped being a rollercoaster since I started in 2007. To look forward I'm peeking back, and this summer was packed and full of soul searching. I spent time with my kids, with my friends, and with my family. I went on bachelorette weekends and college visits. I took the boys to beaches, play dates, and Davis Farmland 274 times. I read a ton of good books and wrote less than I wanted to. I changed my mind about my novel's plot and my own future. I bought some cute clothes and drank too much iced coffee. I started using Spotify and grilling outside. I'm growing into my skin a little bit more every day, and I'm getting stupid excited for my future. I've rearranged my classroom to make my library bigger and put my desk in a new place- this is the first time I've made changes like that since Milo was born. I'm setting up a reward system for myself to reinforce healthy habits. I'm making plans to celebrate my sister's wedding and an October visit from my parents. I'm reflecting on three decades of making big mistakes and figuring out what I've learned, so stay tuned for a "Now That I'm Thirty" post here. I have some big things in the works for my novel, as soon as I buckle down again. I have some interviews with some really terrific self-possessed ladies that I can't where to share. Good things are ahead. There is so much to look forward to, and even though I've said it fifty times, I'll say it again: I'm lucky, lucky, lucky to have this cyclical routine of work and play. My teacher life gives me plenty of time to get excited for each new season, and I am ready for a new school year, right on schedule. Are you looking forward to a fresh September start? What rad things did you do this summer? Look back, look ahead, and stay lovely. 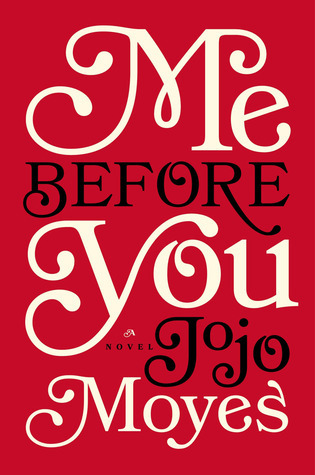 This is a review/discussion of Me Before You by Jojo Moyes, and contains spoilers that are central to the plot. You have been warned! In August, we read Me Before You, and I was duly humbled by own stupid assumptions. I picked this book because I thought it would please a wide audience. My own tastes are so narrow right now (female-lead romance-heavy young adult fantasy, please) and I thought that this book would be boring but necessary to include all my friends in the book club goodness. I expected to force my way through it without really getting too involved. I was wrong. This is the story of a young man who is paralyzed in an accident and the young companion hired to help him out around the house. A well-worn tale, brightened up by spunky British characters and a socioeconomic contrast that I've seen from English authors before. Will was predictably cold and rude in his wheelchair. Louisa was a little kooky and reminded me a little bit of Bridget Jones if she had never moved to the city. That is a high compliment coming from me. Bridget Jones is my girl. The secondary characters came across as one dimensional (wacky lower class family, distant and loveless upper class family) and I was kind of rolling my eyes well into the first few chapters. BUT THEN. Then, midbook, we get to Louisa's birthday dinner (this is around chapter 11) and then, things finally started to click for me. I don't know if it was seeing Louisa and Will's caretaker/patient relationship through her family's eyes, or Will's birthday gift (THE BIRTHDAY GIFT), but all of the sudden, I cared. "Now he was just Will- maddening, mercurial, clever, funny Will- who patronized me and liked to play Professor Higgins to my Eliza Doolittle. His body was just a part of the whole package, a thing to be dealt with, at intervals, before we got back to the talking. It had become, I supposed, the least interesting part of him." And soon after, I more than cared. I was desperate to know what was going to happen, even though I was pretty sure I knew what what going to happen. I did not know what was going to happen. It was clever, really, what Moyes did. Louisa's plan to distract Will and show him a life worth living was fraught with setbacks, each progression of Will's happiness paired with a let down that seemed just bad enough to make the reader fear that Louisa wouldn't succeed. When Louisa and Will make it to their tropical vacation, against all odds, and have their moment in the sand, I was sure that I had suffered enough to get the romantic release I was expecting. BUT THEN. "It's not enough for me. This- my world- even with you in it. And believe me, Clark, my whole life has changed for the better since you came. But it's not enough for me. It's not the life I want." I was socked in the gut. I honestly didn't expect it. I was thinking "Woah, awesome, this is really going to come down to the line. I love this suspense." So Will goes to Switzerland and Louisa is miserable at home and then there is the phone call that Will wants to see her and at that point I was soooo smug. "There it is. The final, desperate, last-ditch romantic moment." Louisa is starting to accept that she might lose Will, which I found to be an encouraging sign. I KNEW THERE WAS A SEQUEL TO THIS BOOK, SO I DID NOT DOUBT THAT IT WOULD ALL WORK OUT IN THE END. I was reading so fast that I almost missed it. I literally went back and thumbed through the pages I had just read; I had to check to make sure I understood. Louisa is truly not enough to change his mind. Will goes through with it. I was gobsmacked. Totally gobsmacked. I'm not sure how I feel, even weeks later when I've calmed down. With some distance from the actual event of reading, I can see Will's point of view. I loved his explanation ("And I don't want to look at you every day, to see you naked, to watch you wandering around the annex in your crazy dresses and not...not be able to do what I want to do with you. Oh, Clark, if you had any idea what I want to do to you right now. "), his desire for a BIG life, and his follow through, even though it was crushing. I am wildly curious about the sequel- do we see Louisa using the gift Will left her? Does she meet up with her friend from the message boards? How will Will factor into her future? Because I know he'll be there. If you've already read this book, I'm dying to know what you think. Did you expect events to play out the way they did? Do you support Will or feel disappointed by his decision? What do you see Louisa doing in her now-supported future? Will you read the sequel? So this is it. You are scored on my heart, Clark. You were from the first day you walked in, with your ridiculous clothes and your bad jokes and your complete inability to ever hide a single thing you felt. You changed my life so much more than this money will ever change yours. Be Your Own Book Club pick for August: Fallout by Gwenda Bond. A young adult story about Lois Lane in high school. Read along if you dare!